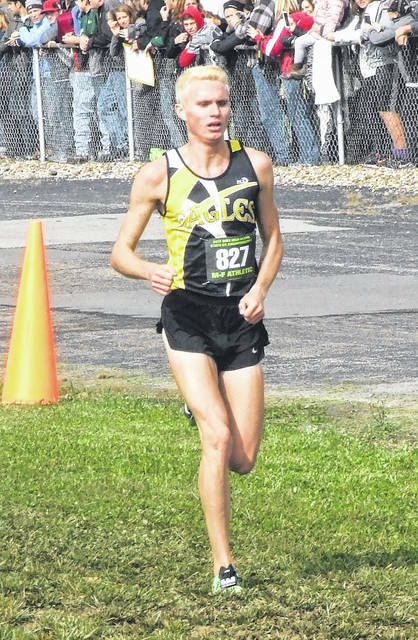 Colonel Crawford’s Chad Johnson heads down the final stretch on his way to claiming his second straight state cross country championship in Division III. Chad Johnson closed out his high school cross country career with his second straight Division III boys’ state championship on Saturday, winning the race at Hebron’s National Trail Raceway in 15:33.7. Johnson, a Colonel Crawford senior, jumped out to the lead at the beginning of the race and never relinquished it on his way to a 12.2-second win over second place Brendon Siefker of Ottoville. Johnson noted that was just how he envisioned things going. Johnson, who will run both cross country and track at Iowa State University after graduating, noted that with weather conditions making the course a bit sloppy, he was unable to achieve a new personal best. Johnson also won last year as a junior. He was seventh as a sophomore and 33rd during his freshman year. Making the day even more special for him was that he was able to run in the race with his team. The Eagles finished 19th overall in the 20-team race. Wade Hopkins placed 106th in 17:35.9, while Braxton James took 146th in 18:23.1. Alex Mutchler finished 167th in 18:56.5 and Mason McKibben ran 171st in 19:06.4. Also, Jacob Hoffman took 174th in 19:13.6 and Zach Leonhart was 179th in 19:43. In the Division II boys’ race, Galion had one runner compete. Braxton Tate finished in 57th place with a time of 16:55.8.